Jean Luc has a classical background. He was educated at Cadre Noir de Saumur in France. But he all the time thought that the classical approach was not enough. Therefore he turned into science. The knowledge evolve all the time. Even five years ago we didn’t know what we know today. So we all the time have to question our knowledge and keep searching for new knowledge. The classical approach are doing many good things, but it is based on old knowledge. Jean Luc was competing in gymnastics when he was young. One of his trainers was fantastic at analysing a problem (for example landing not straight after a triple volte), finding the source of the problem (unequal strength in the right and left side of his back muscles) and to correct the problem (strengthen the back muscles and make them more even). Jean Luc thought that it must be the same in riding, but probably only at a high level. Then he started grand prix and realised that there was still no analysis like that. The equestrian world still work like this. Often the horse is blamed for not being able to do a movement or for not wanting to do a movement. Most of the time no one is analysing the kinematic abnormalities. If you instead analyse the movement and find the source of the problem, you can most of the time fix it. It is the back muscles of the horse that coordinate the movements of the limbs. 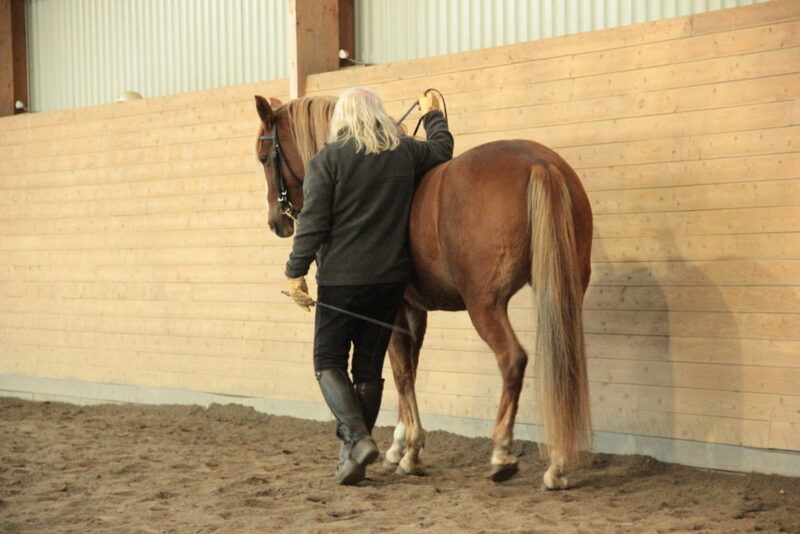 Therefore the most important thing to get the correct movements or to rehabilitate a horse with a kinematic abnormality is to teach the horse to coordinate the back muscles. And when you ride it is the riders back muscles that influence and control the horses back muscles. Most vets says that it is the legs of the horse that creates the problems in the back. That is not true. It is actually the back that creates the problems in the legs. The stance starts with the breaking (or decelerating) phase. That is an important part of the balance control. After that the pushing phase comes. Since the pushing is partly directed upwards, also the pushing phase is important for the balance control. During the impact and the breaking phase elastic energy will be stored in the tendons, ligaments and muscles. That elastic energy is reused in the pushing phase, to create an upward push. You need a slow cadence to be able to create this elastic energy and store it during the breaking phase. If you ride to fast the horse will instead just push the weight into the front legs. Standing still, the front legs of the horse carry about 60 % of the weight. When moving, this increase up to 70-75 % of the weight. Then the front legs can’t propel upwards. Instead the front legs are going backwards. Then the back muscles don’t convert the push from the hind legs into upward force. Instead the push is just loading the front legs. The force comes from the hind legs oblique (diagonally) and the back muscles will convert this force into a lift in the chest. If you have a horisontal and a vertical force then you need both horisontal and vertical muscles. Or, if you have oblique muscles, like you have closest to the spine, you can create both horisontal and vertical forces. It is important that the hind legs decelerate the forward push properly to avoid loading the front legs with to much weight. If the hind legs don’t decelerate properly, there will be to much forward push going thru the back, so the back muscles will not be able to convert it into an upward force that lifts the chest. Therefore, to teach the horse to break with the hind legs is a prerequisite for making it possible for the horse to coordinate the back muscles properly. An old theory from 1946 that says that the abdominal muscles flex the back of the horse. Today we know that it doesn’t work that way. Even though we now have the knowledge, most riders keep on riding due to the bow and string theory. Straightness don’t exist! The horse is never straight! A horse can look straight, but still be crocked. When the left front leg moves backwards, the thoracolumbar spine bends to the left. When the right hind leg moves forward, the lumbar spine bends to the right. Therefore, the horse will always be more or less in an S-shape. The imbalance comes when the horse bends more to the left or more to the right. Then the rider feels that the horse is pushing him over to the right or the left side. This is because of an imbalance in the back muscles. The bend of the thoracic spine will influence the shoulders and the pelvis. Therefore also the front legs and the hind legs will be influenced by the bend. When the thoracic spine is crocked, you will automatically have an imbalance also in the legs. When one hip is more forward than the other, one hind leg will go more forward than the other. The hind leg that go to much forward will have to much strain on the upper part of the hook and the hind leg that go to less forward will have to much strain on the lower part of the hook. Therefore, crookedness put to much strain in the joints of both hind legs. When the horse is crocked he will tell the rider that he can’t do it, but he will not be able to find the solution himself. It’s the responsibility of the rider to analyse the crookedness in the horse and to find the source for it and correct it. There is a small movement between the vertebras in the spine in longitudinal flexion and a small movement in lateral bending and in rotation. These movements are not exactly the same, but almost. Therefore the bending and rotation will help to get more longitudinal flexion and the longitudinal flexion will help to get the bending and rotation. So if you for example have a problem with the bending to the right, you can ask for a little more longitudinal flexion and then the bending to the right will be easier. How can the rider help the crocked horse? This should be done with the seat! The bending in the thoracic spine occurs between the riders upper thigh. Lateral bending is between T9-T16 and rotation between T9-T14. The rider need to be totally vertical and the whole body of the rider need to be able to turn a tiny bit to the left or to the right. The upper thigh should hug the chest of the horse, but not squeeze. The knees should not squeeze either. In walk and trot, one hind leg pushes while the other hind leg decelerates. The push from the hind leg will create a diagonal force into the back of the horse. The riders back is very important in the process of converting this diagonal force from one hind leg into a forward force. If the rider follow the diagonal force the rider will move to the side. And when the horse push with the other hind leg the rider will move to the other side. Then it will be impossible for the horse to convert the diagonal forces from the hind legs to forward movement and upward force. Therefore it is very important that the rider is resisting this diagonal force with a muscle tone and tensegrity. If the rider is to suppled he will just follow the diagonal forces of the horse. If the rider is contracting the same problem occur. What we call straightness i not really straight, but it is narrowing the corridor. When the corridor is wide the body of the horse in every step moves right and left. When you narrow the corridor the horse stays in the middle, and the forces go straight. The rider must sit with the upper body exactly above the seat bones. If the upper body is behind or in front of the seat bones, you will influence the back of the horse from back to front or from front to back. Then the horse can’t coordinate the longissimus and multifidus muscles. It is only when the rider is totally vertical that the weight of the rider doesn’t influence the back muscles of the horse. Every movement of the rider is disturbing the horse. You can influence the horse by changing your muscle tone to direct the energy in a particular direction. So you don’t need to use movements in riding. If you are balanced (vertical and with tensegrity) then directing the energy by changing the tone is enough. The traditional way of thinking is that the muscles are moving the limbs of the horse and the amplitude of the movement is determined by the extension of the limb movements. This is not really true. One example of this is a small dog with very short legs that are bouncing up in the air several times its own size. The dog is not bending the legs and using the muscles to push itself up in the air. There is something called elastic energy that can explain this better. Following are quotes from several different scientific studies that together explains how this work. (The role of the extrinsic thoracic limb muscles in equine locomotion, R.C. Payne, P. Veenman and A.M. Wilson, 2005). In this study they show that there are not primarily the contraction and decontraction of muscles that creates locomotion. Instead it’s mainly the length change in the tendons and muscles aponeurosis that create locomotion. This scientist is a mathematician who has only studied horses. He was hired by NASA for two years, because they needed to find a way to create maximun movement with minimum energy, and the horse is one of the best animals to do this. The major advantage of the system is that the lower limbs are very light weight while the joints can still be actively moved and can contribute to the propulsion. The digital tendon is an example of a tendon that cover several joints. It can store energy in one part, which is used to produce stability in another end. It looks like the hind legs should be better suited to create upward force than the front legs, since they can bend more. If the upward force was created by the muscles bending the joints and then straighten them, this would have been true. But this is not how it works. It is the front legs that creates the largest amount of upward force. The upward force is not created by bending the joints. Instead it is created by storing and releasing energy. This is why bouncing animals (horses, dogs and other animals) have almost straight legs. After impact the hind legs are breaking and in the end of the stance phase they push. The hind legs are actually only creating 43 % of the upward force and the front legs are creating 57 % of the upward force (H.W. Merkens, H.C. Schamhardt, G.J van Osch and Anton J. van den Bogert, 1993). In a good piaffe the hind legs are breaking much more, to keep the weight of the front legs. Then the hind legs are only creating around 20 % of the upward force and the front legs are creating around 80 % of the upward force. So, in piaffe, the horse is actually not moving the weight from the front legs to the hind legs. Instead it is the breaking phase of the hind legs that increases and the pushing phase that decreases. so instead of a weight change, it is a change in forces that occur when the horse collects. If the hind legs are pushing to much weight onto the front legs (like when the horse is going to fast), then the load on the front legs will be to high and the front legs can no longer propel upwards. Instead the front legs will just be just pushing the weight from one front leg to the other. The thing that makes it difficult to sit in the trot is the breaking phase of the front legs. If the front legs break to much it is because they carry to much weight. Therefore the hind legs must break more (instead of the front legs) to get a more comfortable trot. When you ride you feel a lot of movements, but the spine of the horse can only move 53,1 mm. What you feel is instead the push from the legs. The hind legs are pushing the riders spine diagonally forward and the front legs are pushing the spine of the rider backwards. What the rider feel is the sum of the movements of the spine and the legs. Therefore the rider need to resist the movements of the pushing legs by not allow this movement in the riders spine. Then the rider can start to match the movements in the horse and then the horse can start to follow the rider. The force by the hind legs and the front legs meet at one point in the spine of the horse. This is where the rider should sit. That is the point where the movements are smallest. Every movement in the rider that exceed the movement in the spine of the horse, will make it impossible for the back muscles of the horse to work properly. Therefore it is important that the rider sit exactly at the point where the force by the hind legs and the front legs meet and that the rider resist the movements of the pushing legs in the spine. Otherwise it will be impossible for the back muscles of the horse to work properly. As you can see, there are several different studies that show that movements can be created in more energy saving ways. Horses are flight animals. They are designed to be able to run very fast without using so much energy. Thats why they have so long tendons. The tendons can therefore store more elastic energy that can create more movements. Eccentric contraction: The muscles are lengthened, but resist. This is a very strong force. Concentric contraction: The muscles are shortened. This takes a lot of energy, but does not give much force. Power absorption is usually associated with eccentric contraction and power production is usually produced by concentric contraction. Power absorption can also be caused by elastic energy stored in tendons and ligaments. The subsequent power production originates then from the release of elastic energy instead of concentric muscles contraction. Impact force are absorbed by eccentric contraction. This create elastic energy that is stored in tendons and aponeurosis. When pushing the horse is using concentric contraction. If they have stored enough elastic energy from the eccentric contraction, they don’t need to use so much energy for concentric contraction to create the movement. When the horse realise that the movement can be effortless, the horse get interested in the work. The balance between decelerating and pushing with the hind legs and the frequency of the strides are key components for energy optimisation movements. Every horse has a window of cadens (an interval of stride frequency) where energy optimisation is possible. With training you can start to widen this window a little. ”Create lightness, prepare the body for the movement, request, let the horse execute the movement, criticise.” (Beudant) This should all the time be the way to work the horse. To execute a movement is not the difficult thing. The difficult thing is to prepare the horse properly for the movement. If the horse is properly prepared, you don’t need to add so many aids while executing the movement. Inside the Bicept bracci there is a tendon. During the stance there is a tension of the tendons that will maximise the swing. This is called the catapult mechanism. Muscles contract progressively. The tension of the tendon can therefore create a faster and larger swing. One practical example of this is when you go from a half pass and rebend the horse to go straight. In the half pass the bicept bracci both stabilise the shoulder and move the limb forward. When going straight the bicept bracci only move the limb forward. During the first few strides of going straight you can keep both these functions, which will create extra lift and energy, like a catapult. The work in hand is a perfect way of working with the brain and intelligence of the horse. Even thought we are not sitting on the horse, when we walk beside the horse he will react on the tone in the humans body. The work in hand is also a perfect tool to influence on the way the spine of the horse is working. Therefore it is a good tool for rehabilitating a horse or a good way to start educating a new horse. In this way you can teach the horse how to convert forward push into upward push before it need to carry the rider. The thing that the rider need to learn is to increase the decelerating phase with the hind legs. When the horse do that he become light in the forehand. When you can do this the horse is ready to trot in hand. With the young horse you will work in hand i walk for a couple of months before the horse is ready to do the same work in trot and eventually also in canter. Therefore you also work the young horse on the lounge. Because there you can work with all gaits. The riding will be much easier when you have already educated the horse in hand. You can chose to always be on the left side or on the right side or to change sides. No matter which side you are on, you will sometimes be on the inside and sometimes on the outside, since you sometimes turn left and sometimes right. In the beginning you are using the hand. You straight your body, and when the horse doesn’t react you use the reins to stop the horse. When you have repeated this several times, the horse will start to slow down (or stop) when you straighten your body. Then you don’t need to use your hand as much. So, just in the same way as in riding, you are using your tensegrity to control the cadens of the horse. This works because the horse has a very high degree of perception. To avoid pulling on the reins Jean Luc prefer that you take the reins from beneath into your hand (then you will not be strong enough to pull on them). The horse need to learn to be light, because in this position you will not have much strength. The hand need to stay still. To be able to keep it still you rest your arm on the saddle. If you are on the left side and you want to turn right, you place the poll to the right and you place yourself further in front of the shoulder and turn right. To turn left you place the poll to the left and you place yourself closer to the saddle. When you teach the halt you can place yourself in front of the shoulder. You should not do this with a bitless bridle. To have a pressure on skin with bone under is more painful to the horse than to have pressure on soft tissue like the tongue. Therefore you should always use a bit. In the beginning you use a snaffle, but when the horse is more advanced it is better to use the double bridle. Then you just let the snaffle reins hang and use only the curb rein. The curb is straight and therefore it is easier to place the poll more precise with the curb than with the snaffle. Jean Luc never use a cavesson, because it is not as precise as a bit. The cavesson is not stable enough. It is moving a little on the head and then you loose the precision. Jean Luc doesn’t do long reining. The main reason is that the horse will shorten the neck. The second reason is that it is very difficult to influence the back of the horse when you are so far from this area. You can influence on the mouth through the reins and you can influence the hind legs through your position. But you can not influence the back.